Note: This post is NOT financial advice! This is just a fun way to explore some of the capabilities R has for importing and manipulating data. 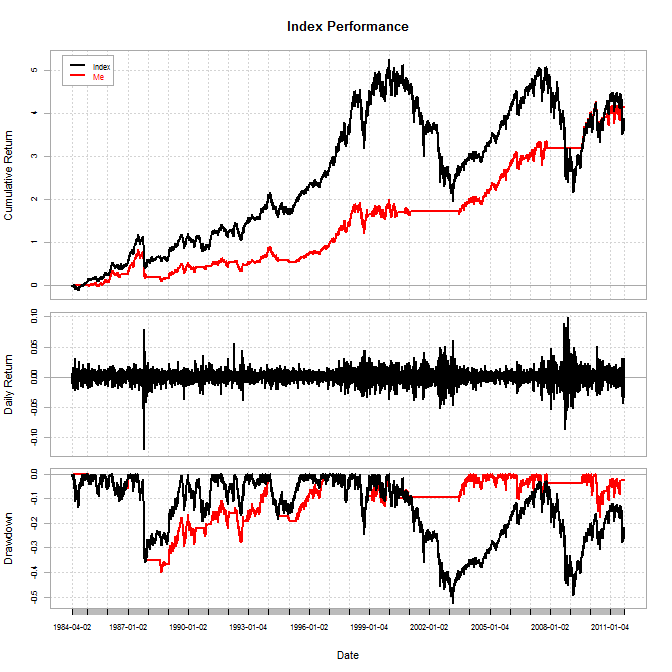 Implementing this strategy in R is simple, and provides numerous advantages over excel, the primary of which is that pulling stock market data into R is easy, and we can test this strategy on a wide range of indexes with relatively little effort. First of all, we download data for GSPC using quantmod. (GSPC stands for the S&P 500 index). 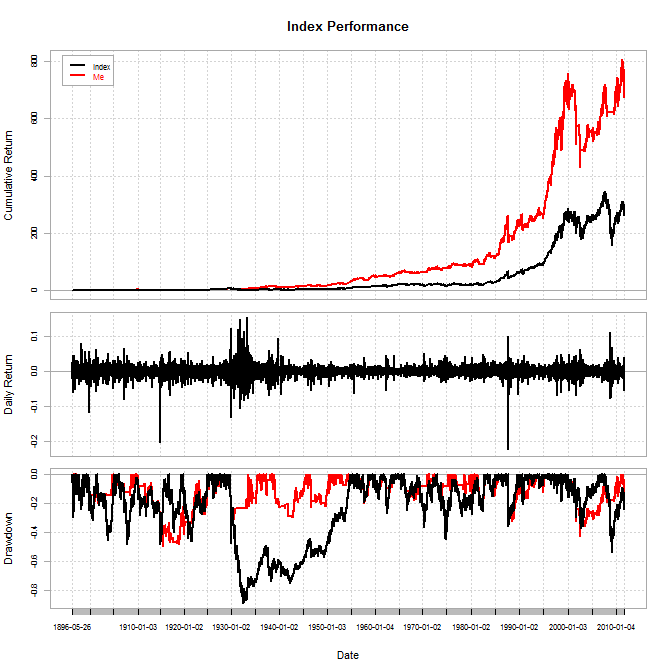 Next, we construct a function to calculate the number of days since the n-day high in a time series, and a function to implement our trading strategy. The latter function takes 2 parameters: the n-day high you wish to use, and the numbers of days past that high you will hold the stock. The example is 200 and 100, but you could easily change this to the 500-day high and see what happens if you hold the stock 300 days past that before bailing out. 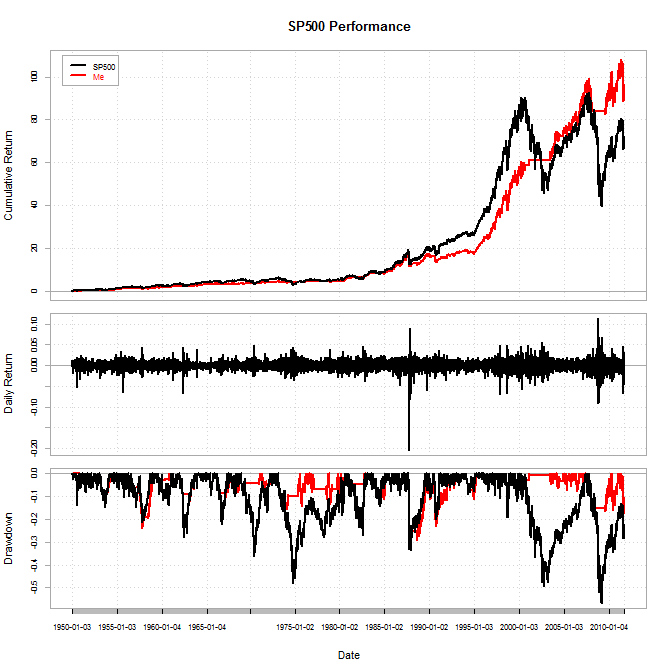 Since this function is parameterized, we can easily test many other versions of our strategy. We pad the beginning of our strategy with zeros so it will be the same length as our input data. (If you wish for a more detailed explaination of the daysSinceHigh function, see the discussion on cross-validated). We multiply our position (0,1) vector by the returns from the index to get our strategy’s returns. 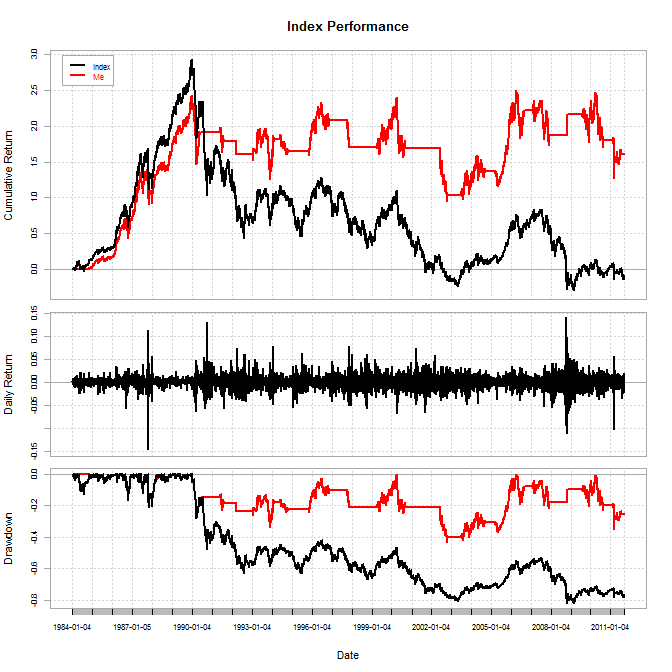 Now we construct a function to return some statistics about a trading strategy, and compare our strategy to the benchmark. Somewhat arbitrarily, I’ve decided to look at cumulative return, mean annual return, sharpe ratio, winning %, mean annual volatility, max drawdown, and max length drawdown. Other stats would be easy to implement. As you can see, this strategy compares favorably to the default “buy-and-hold” approach. The strategy performs well on the other indexes. It even manages a positive return on the N225!